In addition to our products, we are also available for custom hardware and software development for customers with special needs. Many of our current products started as a custom configuration for a particular customer. Using our in-house design tools, we can rapidly prototype possible configurations for you based on your requirements and constraints. Once you place an order with us for a particular configuration, we will fully design your system using commercial CAD software. 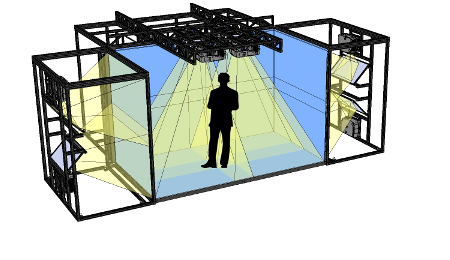 After the design is finalized, we will build and test the system at our facility. We will then install the system at your site. 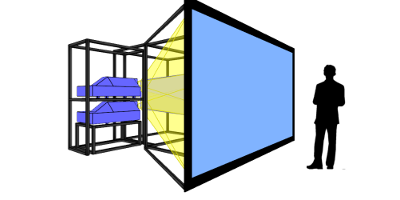 The image on the right shows an example scenario. 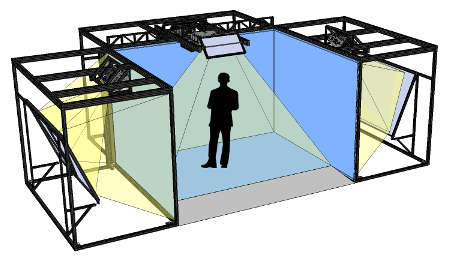 A custom 3-screen immersive VR system (CAVE) is rapidly prototyped to fit in a customer’s space. 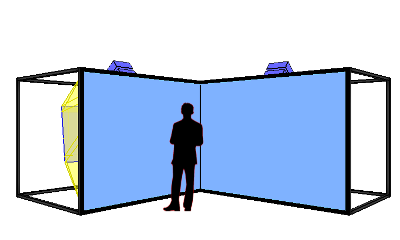 This quick virtual mockup ensures that the system footprint and the lightpaths from the projectors will work within the designated room. After purchase, the details of the design are fleshed out and the system is manufactured and delivered. Another important decision is to choose the number of channels based on your resolution needs. Having multiple channels multiplies the resolution for very high resolution applications. The number of channels can be anywhere from 1 to 50+. 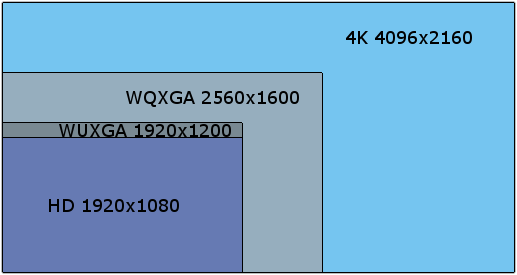 An alternative to mutliple channels per screen is to use 4K projectors (4096×2160). A single 4K channel (mono or stereo) has very high resolution with a perfectly seamless and uniform picture. See the table below. Very high resolution configurations exceeding 8 Mpixels are colored green. *This table shows a few examples. Many more configurations are possible. Aside from the number and type of channels, a structure needs to be chosen. Listed below are 4 major categories of structures. 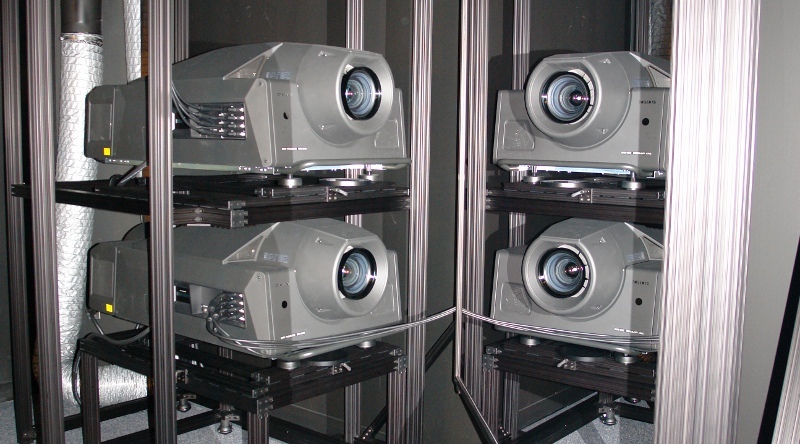 These include everything from the simplest single screen displays all the way to multi-screen, multi-channel fully immersive 3D display systems (CAVEs). Generally speaking, larger screens and multi-screen systems increase user immersion. 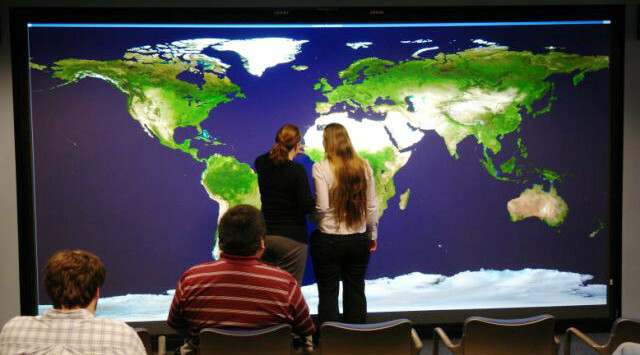 Our systems can be integrated into conference rooms. 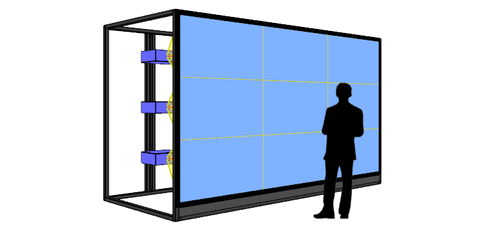 One common example is an immersive 3D or high resolution VisWall system with the screen embedded in the wall and a projection room behind it. 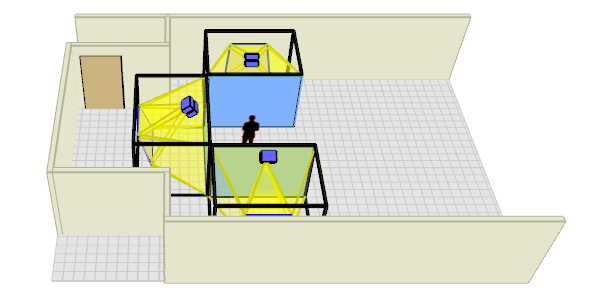 Aside from the choices in display configuration, there are also multiple options for input and tracking devices for VR applications. Want to learn more about these packages? Contact Us. Our systems are available as either standalone displays or as turn-key solutions with graphics hardware and pre-installed software. Whether it is a high-end graphics workstation for a VisBox or a large graphics cluster for a VisWall, our turn-key solutions leverage the performance of the newest in PC graphics hardware.